Attribution modeling is one of my favorite topics in web analytics because it is so complicated and challenging. It forces you to use both your left and right brain simultaneously. It is something which requires deep understanding of your client’s business model and how different marketing channels work together to create sales and conversions. So before using any attribution model, please make sure that you have acquired very deep understanding of your client’s business, his industry and the target market. Because if you don’t then you will end up applying/creating a wrong attribution model and lose lot of money. 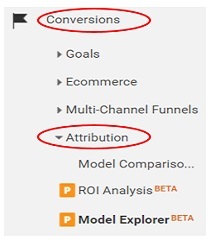 Attribution modeling goes beyond Google Analytics and is a very broad topic. This article talks only about understanding and using attribution modeling in the context of Google analytics. Before I dive deep, there are few topics which I would like to explain upfront to facilitate the understanding of advanced topics later in this article. 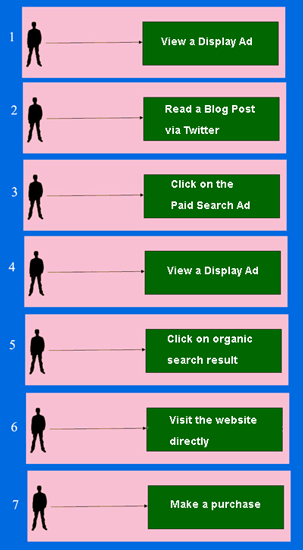 Also known as ‘marketing channels’, ‘digital channels’ or ‘channels’ are the sources of traffic to your website. For example: Paid search, Organic Search, Direct, Social Media, Email, Affiliate, Referral etc are all examples of acquisition channels. In multi channel funnel reports, the acquisition channels are commonly referred to as marketing channels or channels. The definition of conversion is different in Multi channel funnel reports. It can be a Goal conversion or an e-commerce transaction. For the remainder of this article, whenever I talk about conversions, I am referring to conversions in the context of multi channel funnels. If I am referring to Goal conversions, I will explicitly mention it. So remember that and don’t get confused later on. Be careful what you track as Goal conversions in Google Analytics. I have seen analytics accounts where marketers track ‘visit to the home page’ as a conversion or ‘visit to the product category page’ as conversion. Track only those goals which are beneficial to your customers and company. Irrelevant goals can drastically skew your conversion rate and the data in the multi channel funnel reports. Conclusions drawn from erroneous data will result in taking wrong marketing decisions and your client won’t like that. How marketing channels work together to create conversions. What role did prior website referrals, searches and ads played in a conversion. How to attribute conversions to a marketing channel. The overlapped areas show the channels which worked together to create conversions. 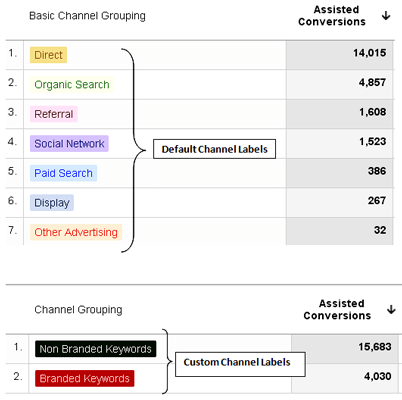 #2 Assisted Conversions Report – This report shows the number of conversions each marketing channel initiated, assisted and completed. It also shows the value of assisted and last interaction conversions. #3 Top Conversion Path Report – This report shows all of the unique conversion paths that lead to conversions. It also shows the number of conversions from each path and value of those conversions. #4 Time Lag Report – This report shows how long it took (in days) for users/visitors to convert. Through this report you can get an insight into the length of your online sales cycle. 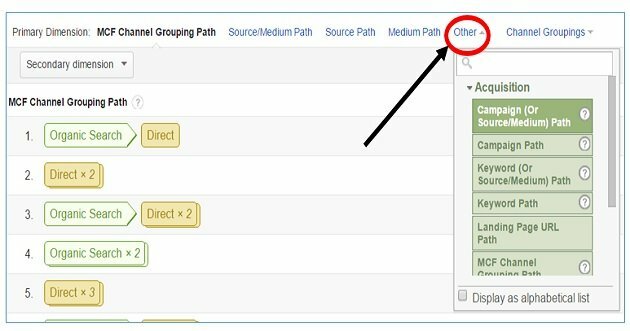 #5 Path Length Report – This report shows the number of interactions it took for your website visitors to convert. In multi channel funnel reports, a conversion can be a Goal Conversion or e-commerce transaction. 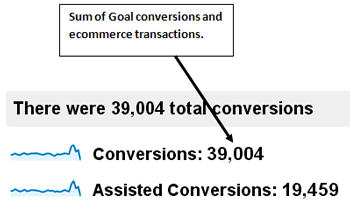 Whereas in non-multi channel funnel reports a conversion means Goal Conversion. The e-commerce transactions are reported separately in non-MCF reports. So total number of conversions in multi-channel funnel reports can be different than the total number of conversions in non-multi channel funnel reports. Multi channel funnels data collection lags by up to 2 days. So their results are temporary out of sync. A Conversion Path is the sequence of interactions (clicks, visits, impressions) with digital marketing channels during the 1 to 90 days period that lead to conversions. Note: The lookback window is available in all MCF reports and you can change the setting by dragging the slider. Note(1): The conversion path is created for each conversion recorded by Google Analytics. Note(2): The conversion paths are recorded via _ga cookie. 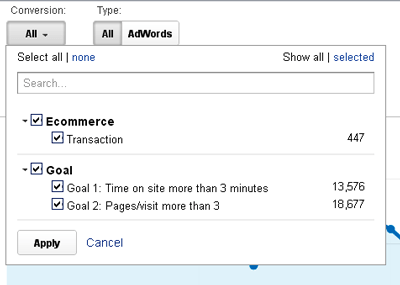 Note(3): There is no limit to the number of conversion paths, Google Analytics can record. MCF data is a combination of conversion data and conversion paths and is compiled from un-sampled data. Since the multi channel funnel data collection lags by up to two days, you may not see this data for today or yesterday in your multi channel funnel reports. You also won’t see this data if not a single conversion has occurred on your website in the last 90 days or conversion tracking has not been set up in your GA view. Interaction is also known as ‘touch’. Channel label is the label applied to a digital marketing channel in Google Analytics. 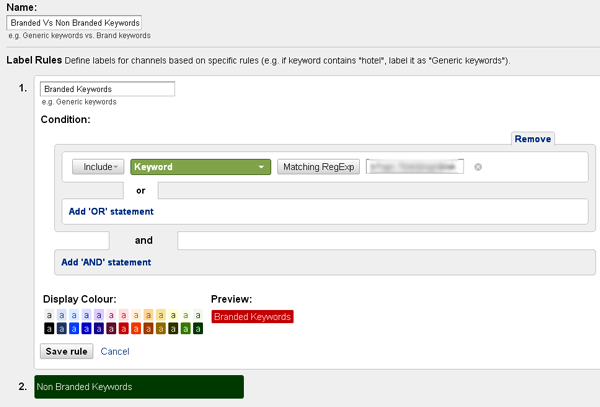 For example, ‘branded keywords’, ‘non-branded keywords’ etc are custom channel labels. The ‘Default Channel grouping’ is the set of predefined channel labels. You can see the example of default and custom channel grouping in Fig.3 above. Defining channel labels is part of creating your own channel grouping. You can define a channel label by creating specific rules. Each rule is based on one or more conditions. Note: You can create as many channel groupings as you want. 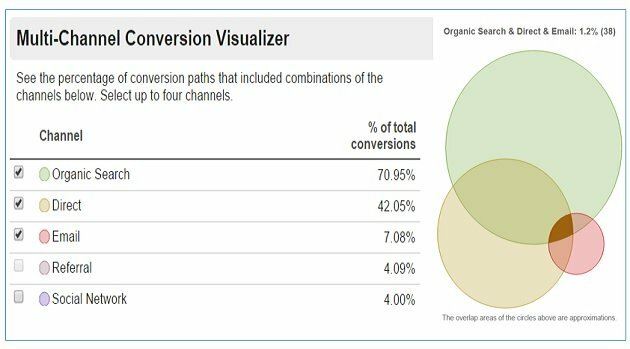 All of these dimensions are pretty self explanatory and if you play with, you can get a pretty good idea of how they can be used to analyze a conversion path. You can segment conversion paths through ‘conversion segments’. They are just like the Google Analytics advanced segments but are meant especially for multi channel funnel data. Through conversion segments you can isolate and analyze specific subsets of conversion paths. So if you want to see all of those conversion paths where the first interaction was ‘paid search’ then select ‘First Interaction is Paid Advertising’ from the ‘Default Segments’ and then click on the ‘Apply’ button. 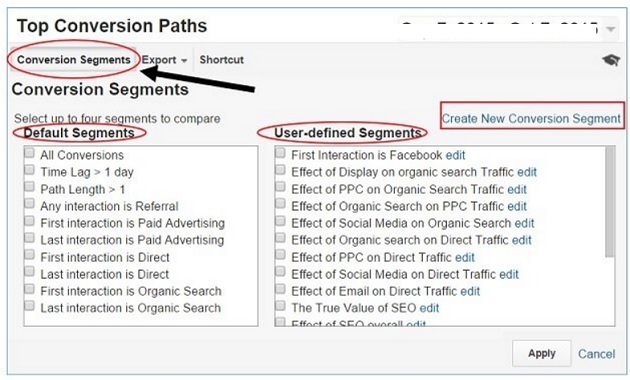 Similarly, if you want to see all of those conversion paths where the first interaction was ‘Facebook’ then create a new user defined segment named ‘First Interaction is Facebook’ by clicking on the link ‘create new conversion segment’ (see the Fig.6 above) and then click on the ‘Apply’ button. Note: You should look at your multi-channel funnel reports in an un-filtered view. A filtered view can corrupt your conversion path data. Use ‘Conversion segments’ instead of filtered views. Attribution modelling is the process of understanding and assigning credit to marketing channels that eventually leads to conversions. You should use attribution modeling to understand the buying behavior of your website visitors. Why people buy from my website? What happens before they buy? What prompted them to make a purchase or complete a predefined goal? The biggest insight that you can get from attribution model is that you can determine the most effective marketing channels for investment. Many marketers / analyst still evaluate the performance of a marketing campaign according to the number of conversions it completed. This is sub-optimal way of evaluating the performance of a marketing channel. If a marketing channel is not directly completing a conversion, may be it is assisting in conversion or may be it is initiating the conversion process. The number of conversions initiated by the marketing channel. The number of conversions assisted by the marketing channel. Both ‘Display’ and ‘email’ are poor cousins of Search Marketing campaigns. This is because they generally don’t get the credit of completing a conversion. But they do/can help in initiating or assisting a conversion. So before you label these channels as ineffective or under invest in them, look at the number of assisted conversions in your ‘Assisted Conversions’ report from these channels. In case of multi channel marketing, no one marketing channel is solely responsible for conversions. Multi-Channel marketing is like a football game. The success of the game depends upon the whole team. You can’t single out a single person and give him the entire credit for winning the game just because he happens to be the person who directly stroked maximum number of goals. The people, who passed the ball, defend the ball, the goal keeper; all play an important role in winning the game. You can compare baseline and custom attribution models with each other, through model comparison tool. Through such comparison, you your marketing from different perspective. The assisted conversion value is the total economic value of assisted conversions. Higher the assisted conversion value, the more important a marketing channel is in assisting conversions. 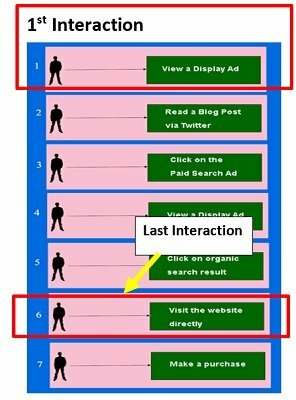 The Last click or direct conversion value is the total economic value of last interaction conversions. Higher the last click conversion, value the more important a marketing channel is in completing conversions. The First Click conversion value is the total economic value of first click conversions. Higher the First Click conversion value, the more important a marketing channel is in initiating conversions. 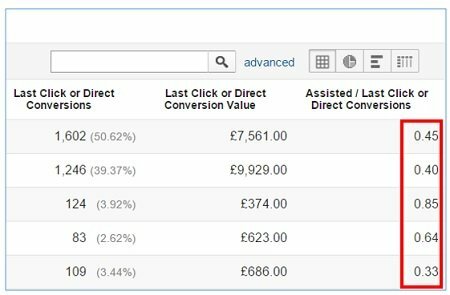 How Assisted/Last click conversion of a marketing channel is calculated and what insight you can get from it? #1 If the value of this ratio is close to zero then it indicates that the marketing channel functions primarily in completing conversions. #2 If the value of this ratio is close to 1 then it indicates that the marketing channel functions equally in both assisting conversions and completing conversions. #3 If the value of this ratio is more than 1 then it indicates that the marketing channel functions primarily in assisting conversions. 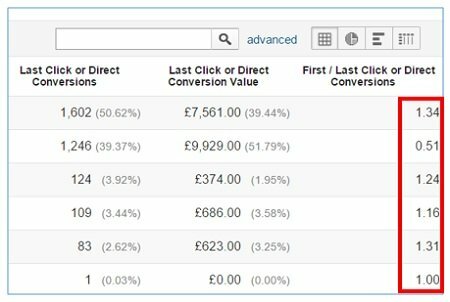 How First/Last click conversion of a marketing channel is calculated and what insight you can get from it? #2 If the value of this ratio is close to 1 then it indicates that the marketing channel functions equally in both initiating conversions and completing conversions. #3 If the value of this ratio is more than 1 then it indicates that the marketing channel functions primarily in initiating conversions. ROI Analysis – This report is available only in GA premium/360 enabled properties. Model Explorer (also known as ‘Data Driven Attribution Model explorer) – This report is available only in GA premium/360 enabled properties.